We are experiencing very blustery strong winds today, so as you can imagine Sheringham High Street seemed rather deserted this morning. We battled against the head wind to get to our favourite coffee shop. We took refuge in the cosy interior and enjoyed a large cup of their excellent coffee, before heading back out and fighting the wind back up the road to Tesco for our food shop. 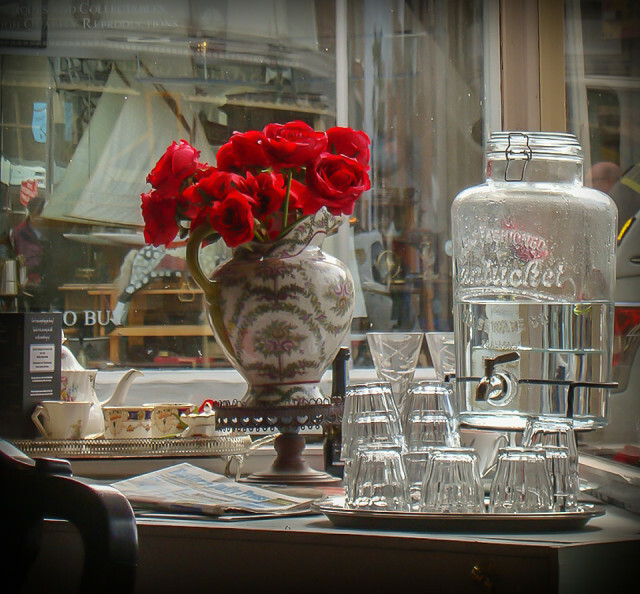 The coffee shop has two pretty bay windows, this one holds the drinking water and these pretty roses, as well as a copy of The Eastern Daily Press for those wanting to catch up on local news.